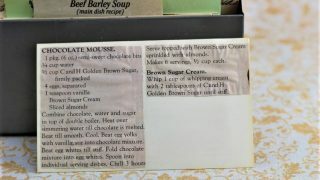 Front of the recipe card for Chocolate Mousse. There are lots of fun recipes to read in the box this recipe for Chocolate Mousse was with. 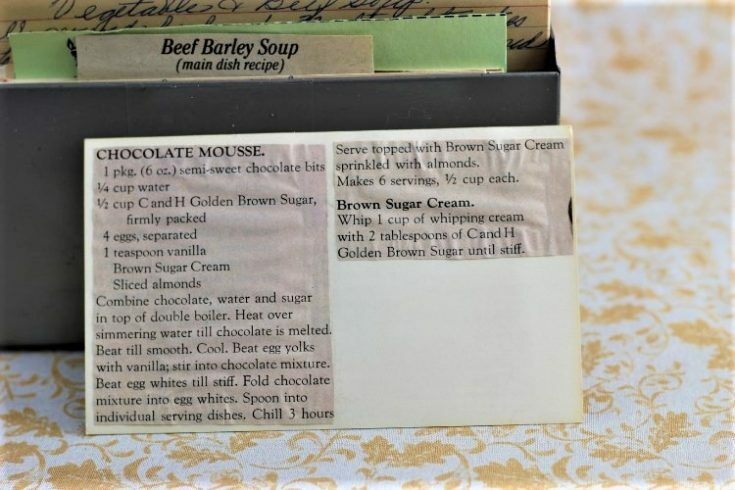 Use the links below to view other recipes similar to this Chocolate Mousse recipe. If you make this Chocolate Mousse recipe, please share your photos and comments below! Combine chocolate, water and sugar in top of double boiler. Heat over simmering water till chocolate is melted. Beat egg yolks with vanilla; stir into chocolate mixture. Beat eggs whites till stiff. Serve topped with Brown Sugar Cream sprinkled with almonds. Whip 1 cup of whipping cream with 2 tablespoons of C and H Golden Brown Sugar until stiff. Makes 6 servings, ½ cup each.